Sleep like a king (or queen) at these regal properties across the planet -- literally! From Medieval-style English manors to an Indian palace in the middle of a lake, GAYOT's Top 5 Castle Hotels give guests the royal treatment. Sleep like a king (or queen) at these regal properties across the planet -- literally! From Medieval-style English manors to an Indian palace in the middle of a lake, GAYOT's Top 5 Castle Hotels give guests the royal treatment. Centuries-old architecture is complemented by modern amenities and luxuriously refurbished rooms, and visitors can while away their days wandering ornate gardens, admiring mosaics and sipping estate-grown wine in true Renaissance fashion. Find your fairy tale ending with this list of lavish hotels. This century-old, French-style château was built to the tune of $11 million -- a value of more than $100 million by today's standards. It sits on 23 acres on the highest point on Long Island, and during its 1920s heyday, it was a mecca for royalty, heads of state and Hollywood celebrities. After decades of various uses, it was meticulously brought back to life as a hotel. Today, there are 32 individually decorated guest rooms and suites, as well as a grand ballroom, library and gardens originally designed by the Olmsted brothers. Days begin with complimentary breakfast in the formal dining room, after which guests can explore the Long Island wine country or enjoy exclusive golf and tennis privileges at the Cold Spring Country Club. 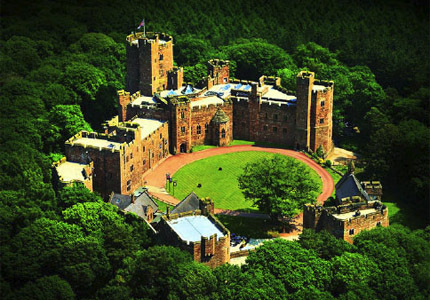 At Peckforton Castle, royal living extends beyond the architecture. Guests can participate in such time-honored traditions as falconry and archery, all the while basking in thoroughly modern luxury. A 19th-century manor house built in the style of a medieval castle, Peckforton has been granted heritage status and is lauded for its environmental practices, from the discreet solar panels on the roof to a policy of purchasing from local purveyors. The 48 bedrooms are done in a contemporary style that emphasizes the romantic ambience, while also incorporating original building features. Additional indulgences include a relaxing spa, the casual 2010 Brasserie in the former scullery and 1851 Restaurant serving classic French and modern British cuisine. Rising like a mirage from the center of Lake Pichola, this lustrous white marble landmark was originally built in the 1740s as a pleasure palace -- an island escape from Udaipur's landlocked, main royal residence. Guests arrive by boat and are immediately ensconced in the kind of ornate opulence unimaginable in today's Philippe Starck-styled hotel world. Romantic is the defining mood here, from the meticulous gardens and lily pond to the bedrooms adorned with silks, mosaics, frescoes and gorgeously carved furnishings. With stained-glass windows and magical views from to-die-for terraces, the suites will take your breath away. Among the dining venues, Neel Kamal pays tribute to the royal cuisine of Mewar. At Jiva Spa, treatments incorporate ancient Indian healing practices. Owned by the Lordship of Siena in the Middle Ages, La Suvera was donated to Pope Julius II in the 16th century. The pope commissioned noted architect Baldassare Peruzzi to transform the castle into a Renaissance villa, and his work can still be seen in this property now owned by an Italian marquis. Overlooking vineyards and olive groves, this Tuscan gem offers 35 accommodations in the Papal Villa and converted farmhouse and stables. The villa suites are especially lavish confections of rich fabrics and jeweled tones. Oliviera restaurant is located in a former mill that dates to the 1770s, and guests will enjoy the pairing of organic estate-grown wines with their meals. The relais also offers an outdoor pool, tennis court, museum documenting the castle's history and full spa with a hydro-massage bath incorporated into the ancient medieval cistern. Estancia La Candelaria is not your typical South American ranch. Located in the Pampas just an hour outside Buenos Aires, the estate is home to its own French-style castle. Inspired by a royal château in Normandy, this lodging offers 10 guest rooms and suites decorated in tasteful Regency style. The property is also home to a country-chic boutique hotel, charming freestanding forest bungalows and a private two-story suite in a circular brick windmill. Featuring an estimated 240 species of trees, the surrounding 100-hectare park was designed by the famed landscape artist Carlos Thays and now accommodates polo, horseback riding and gaucho festivals with traditional cuisine and folk dancing.